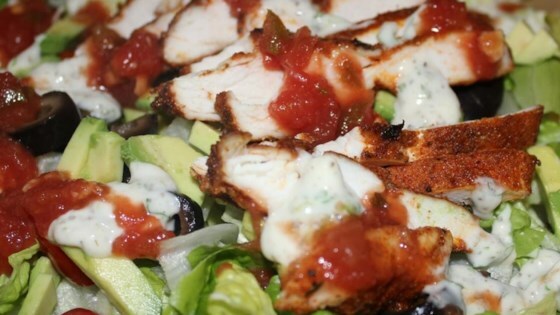 "I love southwestern salads, so I decided to create my own at home. You can add black beans, corn, or spice it up with chili peppers." Stir paprika, cayenne pepper, garlic powder, onion powder, black pepper, white pepper, cumin, oregano, thyme, and salt together in a bowl. Rub spice mixture into each chicken breast to coat thoroughly. Heat oil in a large skillet over high heat. Cook chicken breasts in hot oil until browned, about 5 minutes per side. Transfer chicken to a baking dish. Cover the dish with aluminum foil. Bake in the preheated oven until chicken breasts are no longer pink in the center and the juices run clear, about 20 minutes. An instant-read thermometer inserted into the center should read at least 165 degrees F (74 degrees C). Slice chicken into strips. Fill each tostada shell with 1/2 cup lettuce. Divide chicken, salsa, avocados, Cheddar cheese, and olives between the tostada shells. Top each salad with ranch dressing. This is awesome! Thanks for the recipe! Wow! I'm sure the recipe is great but when I made it the chicken did not absorb ANY flavor so it was flavorless chicken on salad greens = boring. when the most difficult thing about a recipe is putting together the spice mix....well, there's 3 stars right there. the tasty finished product puts it over the moon. a fantastic, fun meal. Yes we will make it again. Very good and easy meal. My family loved it and want me to put it on the weekly rotation.